A limited amount of rooms have been set aside for this offer. This offer is extended to families in childcare & early childhood education programs, RECE’s and support staff. Additional room types may be available, at an additional cost. 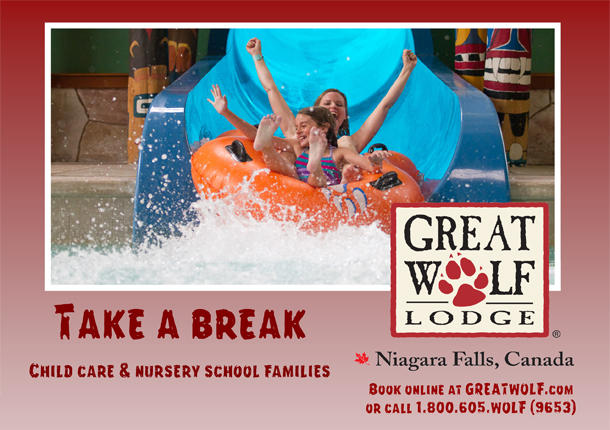 Offer valid only at Niagara Falls, Ontario location for the above dates only. Must be mentioned at time of reservation. Reservations must be made by outlined cut-off dates. Offer is subject to applicable taxes. Limited number of rooms available for each date. Cannot be combined with any other discount or promotional offers. Offer based on 4 guests per room and may be terminated at any time without notice. Additional water park passes are $40.00 per person. Must have one individual 21 years of age or older staying in each room. Offer is not transferable and is not redeemable for cash. Other restrictions may apply. Limited availability, rate subject to change. Next PostRegister Now for our amazing Junior and Senior Kindergarten programs!